The U.S. has always been a top choice on the wish list of artists and performers from across the globe. From a beginner to a professional, who is world famous, everybody is eager to boast their star talents to the American audiences. Foreign artists and performers come to the United States for facilitating the exchange of traditions and ideas, while enriching both the societies.U.S. has always welcomed artists and performers from every genre and appreciated their talent coming from different cultures, showering with recognition, accolades and rewards. The O1 Visa For Artists and Performers is generally offered to those possessing amazing talent in the genre of athletics, arts, business education, science, or in television industry or motion pictures, who come to the US to perform for a specific period. Only individual performers and artists qualify for the O-1 visa category in the United States, which means that a group of artists won’t get qualified for this application. However, one who will accompany the O-1 artist or performer, assisting in a certain event, and his assistance is crucial for the completion of the entertainer’s performance need to seek an O-2 visa. The O-2 visa applicant need to fulfill the critical skills along with the O1 visa artist or performer which can’t be easily performed by any US worker, and is essential for the successful performance of the O1 visa artist. And so, a leader of the band qualify for the O-1 visa and his rest of the band mates are eligible for O-2 visa. For obtaining O-1 visa application, the employer living in the United States, or the US agent, representing, the artist or the performer need to file a petition with the US Citizenship and USCIS (Immigration Service) with the associated documents supporting extraordinary skills in the field. The P1 Visa is For Entertainment Groups means that this classification is available for artists and performers temporarily visiting the United States for performing as an entertainment group to be recognized internationally for a specific period of time. However, contrasting to the O1 visa which is available for individual artists and performers, the P1 visa classification is solely intended for entertaining groups. for obtaining a US P1 visa for artists and performers, the US employer of the specific entertainment group need to file a P1 petition with USCIS, additional to a consultation from a specific labor organization concerning the genre of the performance, or a declaration to prove that the performing group is established and have been performing more often for at least 1 year. The P2 Visa is For Artists And performers Participating In Any Mutual Exchange Program, meaning that artists and performerstemp rarily coming to the US for performing, either as a group or individually, under the reciprocal exchange program between an association in the US and the one in another country. Important support personnel being a vital part of the performance of the P-2 visa artist or performer, need to perform the support services which cannot be willingly performed by any US worker, also eligible for P-2 category. For obtaining the P-2 visa for artists and performers, the supporting organization in the US, or the employer in the United States, need to file a P-2 petition with USCIS, and a written consultation from the suitable labor organization. Proof that the backing organization in the United States was involved in negotiation, or corresponding with the reciprocal exchange program of the United States and foreign artists and performers need to be submitted. The petition also includes the itinerary of the entire event. After the visa petition gets approved by USCIS, artists and performers need to apply for the P-2 visa at the respective US embassy. Reading all this, surely is complex and confusing right? 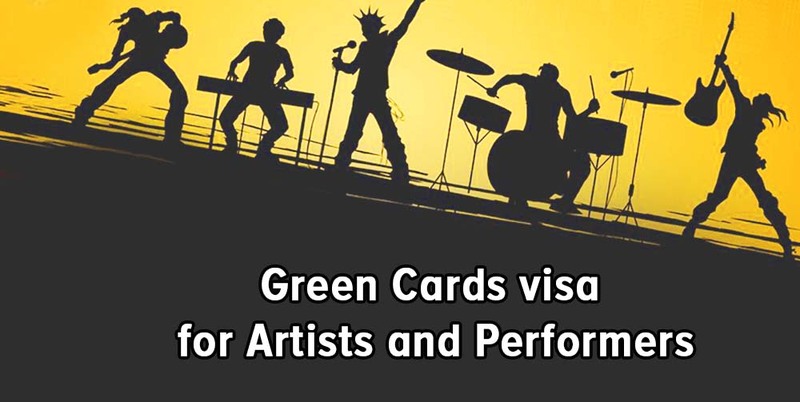 Well, for any assistance regarding Green Cards for Artists and Performers, contact www.ilexlaw.com as the platform is your one stop destination for all sorts of immigration, visa and green card issues. Previous Post How to Get a Working Visa for USA?